Here is art that shows just how profound charm can be. Our Tracy Walker’s Animal Friends journals are the second in our Paperblanks collection featuring the work of Canadian artists. Tracy’s illustrations have graced the pages of the New York Times and a host of products including stamps, labels and greeting cards, as well as delightful infographics and fabulously playful papercuts and shadowboxes. 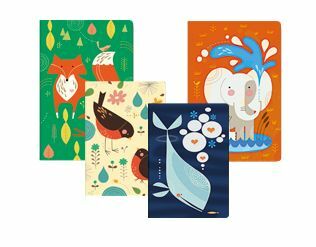 Elephants, foxes, robins, whales and fish receive vivid homage here in images rendered in audacious and appealing colours. Tracy Walker’s work combines a folk-art naiveté with a timeless mid-century feel, as well as wondrous detail that is sure to elicit smiles upon closer inspection. The artist hails from Uxbridge, Ontario, a town known as “the trail capital of Canada,” and finds inspiration in everything from objects on the forest floor and plants in her garden to the sweet and wild creatures that creep and peek around the edges of everyday human life, trailing magic with them.